Signed by Jules David, a prominent French painter and lithographer, who introduced naturalistic situations to fashion illustration. 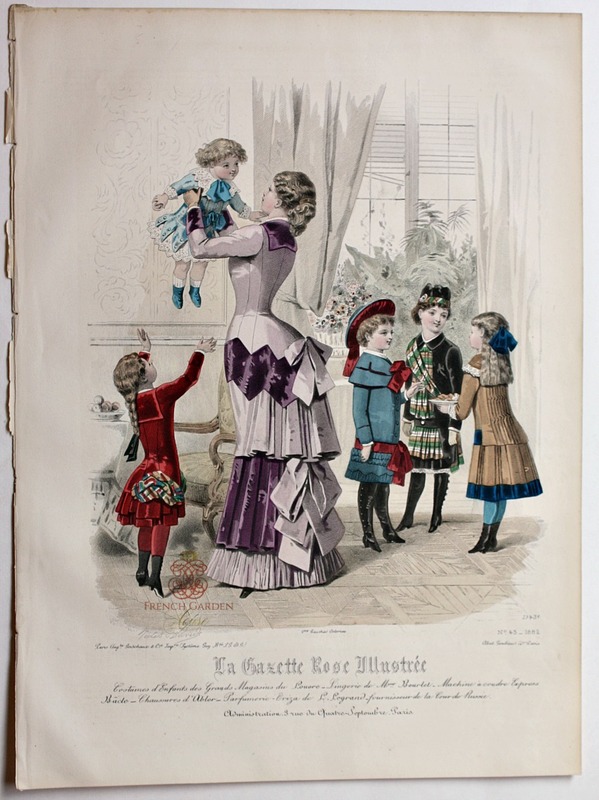 Colored with bright water colors, this print shows a group of young girls, each wearing beautiful period clothing visiting a friend at home. The scene is delightful, with the little "hostess" offering cakes to her guests. The dresses: pink red velvet and plaid sash, a darling Scottish Plaid ensemble with a black velvet coat and trim, a blue dress with bright red sash, ribbon bow and hat ribbons, a camel color dress with teal velvet accents, the little sister wears a frothy lace dress with blue. The detail is gorgeous, their elegant mother looks fetching in her lavender purple with velvet accents bustled gown, she is holding up the little one with great affection.